Chinese tycoon Huang Guangyu has been sentenced to 14 years in prison after being found guilty of bribery, insider trading and illegal business practices. Huang, who was for a time the richest man in China, was also fined 600 million yuan ($88m; £59m), the official Xinhua news agency said. He built a billion-dollar business from almost nothing, after dropping out of school nearly 30 years ago. His business grew into a chain of more than 1,300 stores across China. The court in Beijing said the Gome chain and Huang's property development company Beijing Pengrun Real Estate had between them paid out 4.56m yuan in bribes between 2006 and 2008. The bribes, in the form of cash and properties, were paid to five government officials in exchange for corporate benefits. Tian Wenhua - chair of Sanlu dairy group, jailed January 2009 over the tainted mik scandal. Li Peiying - former head of state firm running several airports, executed in August 2009 for embezzling some $16m. Chen Tonghai - former head of oil giant Sinopec, sentenced to death in July 2009 for taking nearly 200m yuan in bribes. Gome and Pengrun were fined 5m yuan and 1.2m yuan respectively, but Huang was found to be have been personally liable for bribes so was also prosecuted. In addition to the bribery, Huang was charged with manipulating share trading for two listed companies - Sanlian Commercial Co and Beijing Centergate Technologies Co - and of illegally trading HK$822m in 2007. Gome Appliances Co, a mainland subsidiary of the firm Huang founded, was also accused of corporate bribery. As well as the substantial fine, Huang received an order for the seizure of 200m yuan in assets. Previous high-profile corruption cases in China have resulted in a death sentence for the defendants. But the court said that while Huang's crimes were "extremely serious", it had shown leniency in sentencing because he had admitted guilt and co-operated with investigators, said Xinhua. Huang's wife, Du Juan, is also facing trial. The BBC's Damian Grammaticas in Beijing says the case is one of China's most high-profile falls from grace. This is one of the biggest corruption scandals in China for some time - but it is not an isolated case. Barely a week goes by without some official, businessman or person in power being accused of corrupt practices. The government acknowledges that this is a problem. In a keynote speech to China's annual parliamentary session earlier this year, Premier Wen Jiabao vowed to launch a fresh drive against a phenomenon that has "a direct bearing on the firmness of our grip on power". For some, the prosecution of Huang Guangyu will show that the government is serious about fighting corruption. But it is unclear whether or not this one case will lessen corrupt practices elsewhere in the country. After all, major figures from government and business have been convicted before - without any noticeable effect on the levels of corruption. The Gome chain of domestic appliance shops was the second largest in the country. 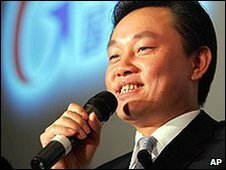 Canny investments in property helped Huang build a fortune estimated to be between $2.7bn (£1.72bn) and $6.3bn at the time of his arrest, and in 2008, he topped the Hurun Report's China rich list. But a few months later he was arrested and he went on trial in Beijing last month. He stepped down as Gome's chairman last year. Bribery and corruption are ongoing problems in China, says our correspondent, but Huang may have failed to cultivate the right contacts, fallen out with influential backers or simply pushed things too far for the authorities to turn a blind eye. Huang appears to have brought several government officials down with him, with various convictions for accepting bribes apparently connected to his case. Those convicted include Zheng Shaodong, the former assistant minister of public security, his deputy and government personnel in the southern cities of Guangdong and Shenzheng.